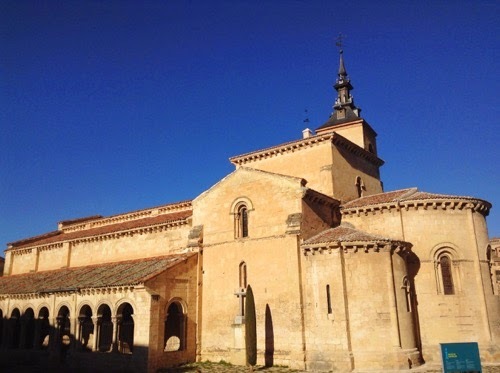 Jetlagged, running on little sleep, and exhausted from the go-go-go life of touring Madrid, my family and I daze out on four spacious seats that face each other while riding the high-speed Avant train from Madrid. The train rumbles beneath a mountain going 250 km/h (155 mph) and sharp blue security lighting regularly whooshes by the windows. The ride is so smooth it feels like we’re flying through the Earth…and then we emerge from the darkness on the other side of the Sierra de Guadarrama mountain range: welcome to Castilla. 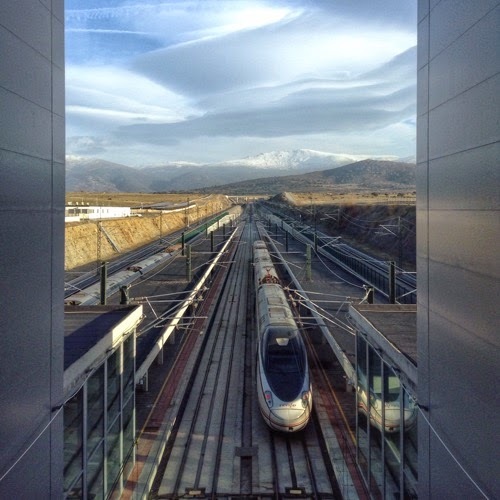 As the train begins to brake for its approach to the Segovia-Guiomar station, we look out the windows and gasp in excitement at the powdered-sugar dusting on the mountains we just cut through. Thankfully, the snow is limited to the mountaintops; the brown, desolate fields that undulate for miles around are dry and lifeless, except for a few steers who are unamused at our arrival. 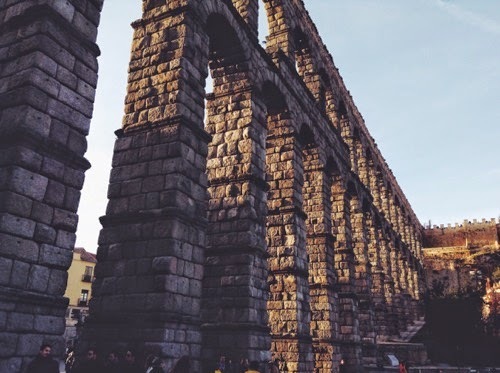 Once we’re settled the shuttle bus, we anxiously crane our necks for a glimpse of the monuments Segovia’s old town is home to: the Roman aqueduct, the late-Gothic cathedral, or the fairy-tale Alcázar castle. As the city bus rattles down a curve paved in granite cobblestone, the aqueduct finally comes into our view. It dominates the busy Plaza de la Artillería and effortlessly leaps from one hillside to the other on forty-four double arches. Colossal granite blocks rest one on top of each other as they have for the past two thousand years, without mortar, and each arch’s keystone floats incredibly without support, demonstrating the ingenuity of Roman engineering. The rest of the plaza is a sight for sore eyes, however; compared with the pretty but pretentious mansions of the Retiro neighborhood our Madrid hotel was in, the half-timbered houses that line the plaza are downright charming. Café tables spill out from these aged homes onto plaza terraces but most people here are focused on their cameras, their selfies and their group shots. By the time we’ve dropped off our bags at the hotel, most of the daytrippers have already left town for Madrid. Besides, the sun is setting and the sky is turning a warm orange and pink. We head out for paseo, that Spanish custom of going for an afternoon stroll after dinner to see and be seen. Before we begin our walk, we stop off at a small wooden shack for a packet of roasted chestnuts. It’s my family’s first time to try these snacks of Christmas carol fame, but I’m not surprised the starchy nut doesn’t win them over. We make our way down the main drag that is overflowing with shops, café-bars, and locals. 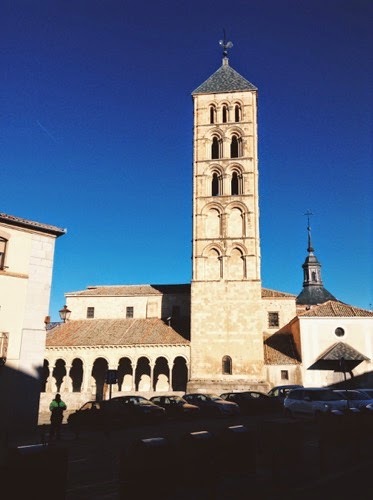 When the road opens up to a plaza, we stop to ponder the sheer ancient-ness of an 800-year-old Romanesque church: its stately arcaded porch, sculpted column capitals, and steepled bell tower. Nearby, we stop to peer in the windows of a busy bakery. Giggling at the name “fartón,” we pick up half a dozen and are pleasantly surprised that these oblong pastries dusted with powdered sugar are actually the perfect afternoon snack. It’s not long before we arrive in Plaza Mayor. 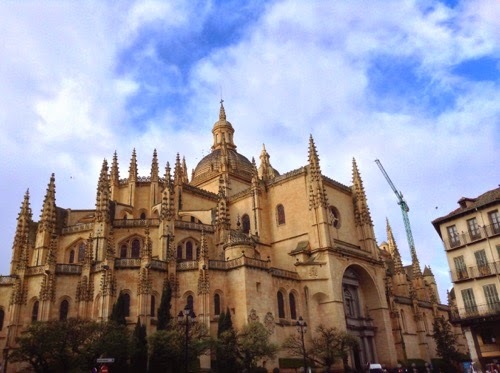 To the left, the cathedral silently oversees the goings-on of Segovia’s main square. Its buttresses, capped with curlicued points, sprawl out like spider legs toward the plaza’s pavement, and the eerie yellow lighting casts a decidedly Minas Morgul atmosphere about the church, as if ringwraiths lurk behind the shadows rather than the Spirit of the Lord. To the right, a wrought-iron gazebo functions just as it would have a hundred years ago. A local tuna or traditional musical group has assembled within and plays Spanish Christmas carols. I’m amazed that, even though I’m familiar with only a handful of them, the band enunciates the lyrics so clearly that I can easily follow along. The guitars, the horns, and the harmonization all combine in this grand public space where locals have gathered, capturing the magic of Navidades, the Christmas season. We hop back on the main drag as it goes down the hill away from the cathedral. Stray cats dash furtively across the sidewalk down deserted alleys, turning their heads to glare at those pesky humans who disturbed their hunt. This hill ends at an extended family of trees that hides the looming Alcázar from our view. Warm lighting illuminates the sheer wall of the keep tower around which Cinderella Castle-style slate-roofed turrets hop and dance. On the other side of the river valley, the eight-sided Vera Cruz Church floats eerily out in the darkness. Turning back toward the city center, we hug the old city walls that swoop out and then back to the northeast. Segovia was first a Roman city built on a defensive bluff surrounded by a river, so it’s very difficult to get lost here: simply look up for the cathedral, which was constructed on the highest point in the city. It’s a great way to keep yourself oriented, as you’re only ever going up toward the church or heading down and away from it. In typical American fashion, we begin looking for a place to have dinner; after all, it’s already (only?) eight-o’-clock in the evening. We find a decidedly untouristy place that looks out onto Plaza Mayor and rub elbows with fur-coat-wearing grannies, who nurse ceramic cups of coffee or short glasses of beer. Although the restaurant is packed with locals and a handful of overworked waiters, we manage to put our order in. It’s not long before we get to savor the simple pleasure of a Spanish plato combinado, or “combined dish” that has a little bit of everything: some grilled pork loin, a few croquetas or fried nuggets, a simple vegetable salad, and some bright yellow French fries. Now sleepy with full stomachs and jetlagged bodies, we head back to the hotel as the town is still finishing up an afternoon stroll—at a little past nine-o’-clock! We work our way around some boys playing an impromptu game of fútbol in the plaza, the soccer ball ricocheting off the cathedral walls and bouncing over the cobblestone. Passing underneath sparkling Christmas lights, we watch as shopkeepers roll down slatted metal grating in front of store entrances, clack-clack-clacking. The streets are thinner now, with tourists in restaurants (or in bed) and with segovianos getting things ready for their nighttime supper. We step again beneath ancient aqueduct arches and arrive back at Hotel Acueducto. 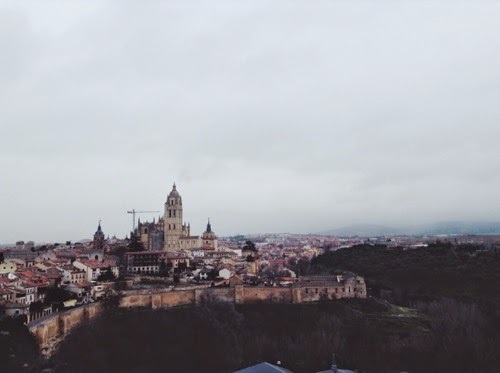 Over a year ago I first visited Segovia and enjoyed checking off the sights I had come to expect any grand Spanish city worth its salt to have: a cathedral, a castle, an archaeology museum, some parish churches, and a local dish (and pastry!). But returning once more, this time with my parents and brother—hardly numb to yet another Gothic cathedral—restored the sense of wonder that Segovia evokes in any passing visitor. Have you ever gone back to a place and had a different experience, either better or worse? Share your stories in the discussion thread below!